Medellin is the second largest city in Colombia with over two million people living and working here. 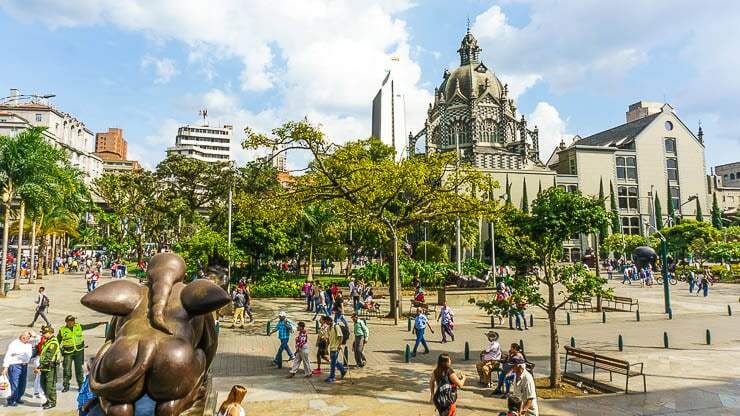 This city has now risen to be one of the best places to visit in Colombia with a number of museums, parks, bars, restaurants, and Spanish language schools. 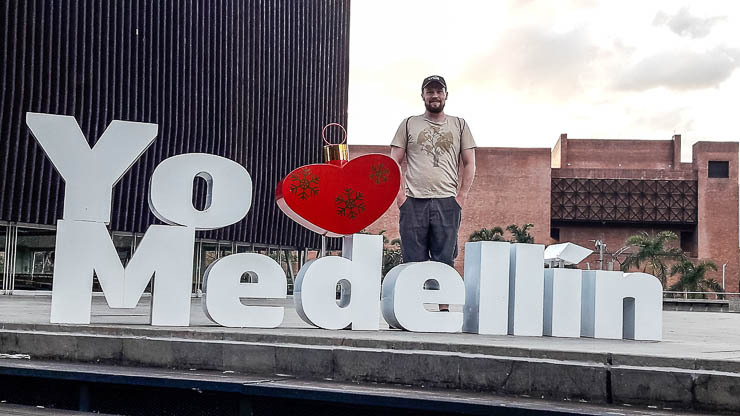 With so many things to do and places to go in this city, you probably need recommendations for the best Medellin hostels from which to base yourself. The city was known to be the most dangerous place on earth in the 80s and 90s because of the drug trade. But now, it is considered one of the innovative cities in the world with a very efficient public transportation system and a rapidly growing tourism sector. When choosing hostels, you should make sure that you tick off your basics: safety, convenience, cleanliness, good service, and the basic amenities like a shared kitchen and lounge. Make sure you also research the different neighborhoods of a certain city that you are traveling to so you can decide where you want to be. 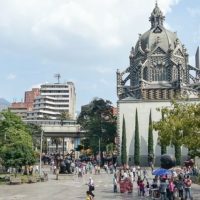 If you haven’t already, you may also want to read my article about where to stay in Medellin which discusses the pros and cons of many different neighborhoods, because while most travelers choose to stay in Poblado, there are a lot of other neighborhoods, including some that I like better. Regardless, in this article, I’ll be talking about the neighborhoods and some of the coolest things to do nearby. There are a lot of hostels now that can even rival the best hotels but with a more social vibe. Let us look at these top 10 Medellin hostels where you can stay. Down below I have included a list of the hotels that can best cater to every kind of traveler (solo, couple, group, or as a family) and their needs (peace and quiet, near the football stadium, near metro stations, etc). I’ve also included a map of these best hostels in Medellin so you can see where they are located throughout the city quite easily. 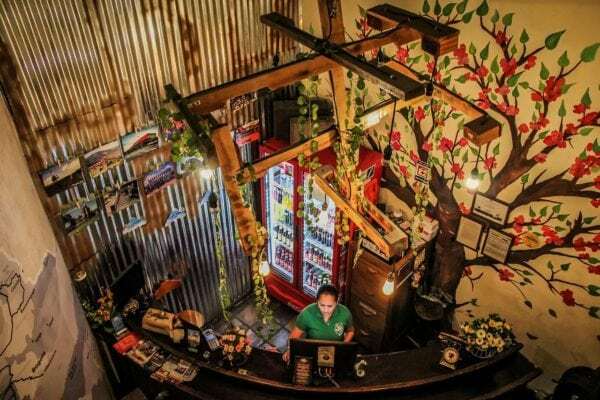 Los Patios Hostal Boutique is a very stylish, upscale, eco-friendly hostel in the vibrant sector of Manila in El Poblado, the most popular neighborhood for foreigners. Staying in Manila means that you are a few minutes walk away from restaurants, nightlife (Parque Lleras zone is just 5 minutes away), shopping malls, and even museums. But you can also easily explore the city because it is 500 meters away from the Poblado Metro Station — much better located compared to staying further uphill near Parque Lleras or Provenza. 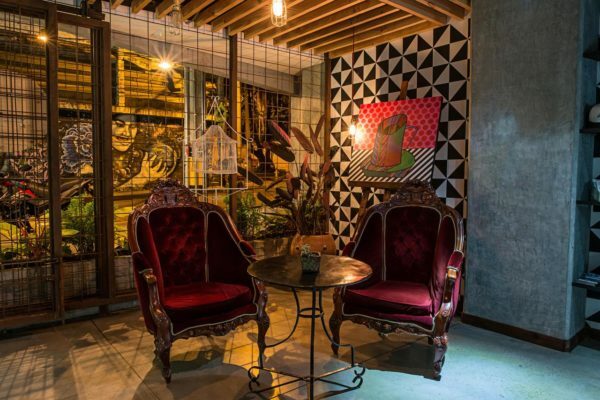 This boutique hostel made sure that they veer away from the usual ‘hostel’. Every part of Los Patios Hostal Boutique is designed to bring everyone together just like what los patios aim to do. The different themed levels are Mountains, Jungle, Oceans, plains, Festivals, Rhythms, Páramos & Nevados, Beaches, Destinations, and River. 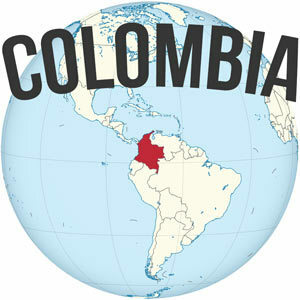 Although different from each other, they all represent the cultural, historical, and geographical wealth of Colombia. Enjoy the night with the other hostel guests in any of the two rooftop bars, the tropical Ziruma Tiki Bar or El Bar with its many craft beers, cocktails and international sounds. They throw great parties with DJ sets, sunset BBQ event, and other interesting activities. Beer in hand and with the night view of the city from the rooftop, you will learn the basics of salsa with a local dance instructor. The salsa night is just one of the many activities arranged by the hostel, most of which are free for hostel guests. Non-hostel guests can pay a fee to be admitted to any of these. 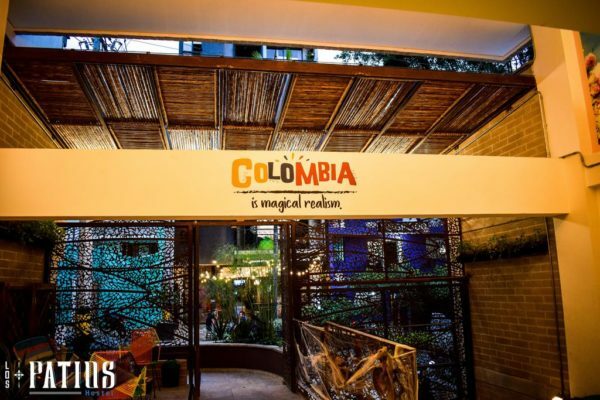 All week Los Patios Hostal Boutique have a schedule for gastronomy nights, night bike tours, mojito lessons, yoga meditation, pub crawls, rooftop BBQ night, exotic fruit tastings, and of course, tasting the famous Colombian coffee. If you would like to stay in, you can stay on the hammock deck, watch Netflix or play PS4 at the TV room (can it even be more perfect? ), or get work done in the coworking space. What is cool is that they offer language exchanges for English speaking hostel guests who want to volunteer to teach English to their employees. In return, these employees teach them Spanish. The hostel emphasizes the impact of their business to the local community. There is also an art exchange with local artists who come in to share their art and also explain their experiences and inspiration. 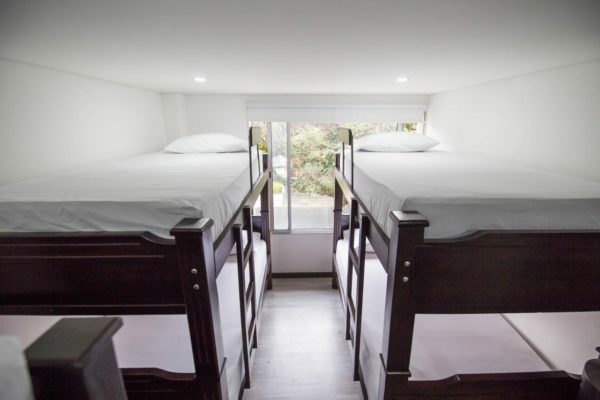 Los Patios Hostal Boutique offers bunk beds in 4- and 6-bed dorm rooms, beds in mixed dorm rooms, and private rooms. With 195 beds in two buildings, you can choose any room for your needs with the room rate starting at $17/night. Some of the dorm rooms have their own private bathrooms and some rooms also have a balcony. Even the communal kitchen allows you to use basic oils and condiments for preparing your food. Get some herbs from the hostel’s organic herb garden, they are free. Everything in this hostel is really about sharing commonalities and differences of every single person coming into this place. Whether it is the kitchen, the rooftop bar, the TV room, or the arranged tours, Los Patios encourages engagement and sharing. There’s a reason this is the top hostel in Medellin. But beyond that, it’s also in one of the best locations (Manila is one of my favorite parts of Poblado). Grab breakfast at Ganso & Castor, an incredible French restaurant located 1.5 blocks away. Get a freshly brewed cup of coffee at Hija Mia, one of the city’s best coffee shops. For a great Paisa meal, head to Hacienda for chicharron or bandeja paisa or another local delicacy. It isn’t the cheapest place, but it’s one of the best. If you’re a digital nomad missing the SE Asian cuisine, head to Halong Vietnamita for some pho or a delicious Ca Phe. For nightlife, you’ll want to check out the nearby El Aleman Pues for a bit of Bavaria or head over to the chic 20Mission brewery just a short walk away in Ciudad del Rio where you can play beer pong or corn hole, hah! The best nearby museum is undoubtedly the el MAMM (the Museum of Modern Art, Medellin). Don’t miss out on the last Friday of the month when the entrance is free! Some people like some peace and quiet when they are on vacation. 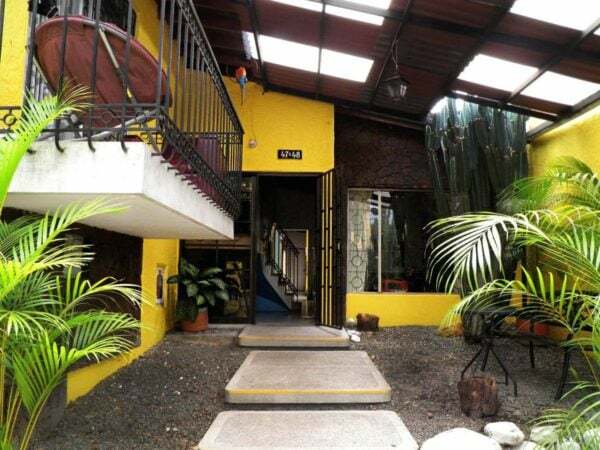 Hostal Cattleya Medellin is a perfect hostel if you would like some of that and to get away from the gringolandia of Poblado. But it is not too far from lots of cool restaurants, cafes, bars, the football stadium, and metro station (5 minutes, so pretty near!) of the Estadio neighborhood. 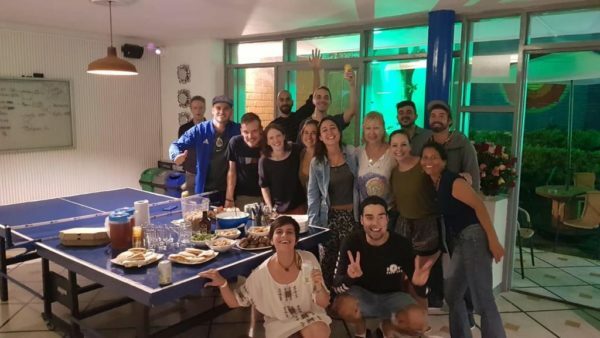 Whether you are in Medellin to study Spanish or a chill vacay, then a hostel that feels more like a home away from home like Hostal Cattleya Medellin is all you need. Room rates start at $9/night in this hostel with beds in 4- and 6-mixed dorm rooms and they’ve also got private rooms. Although Hostal Cattleya Medellin does not offer any arranged activities like the other hostels, they have common areas with a flat-screen TV with Netflix and Xbox 360 too. 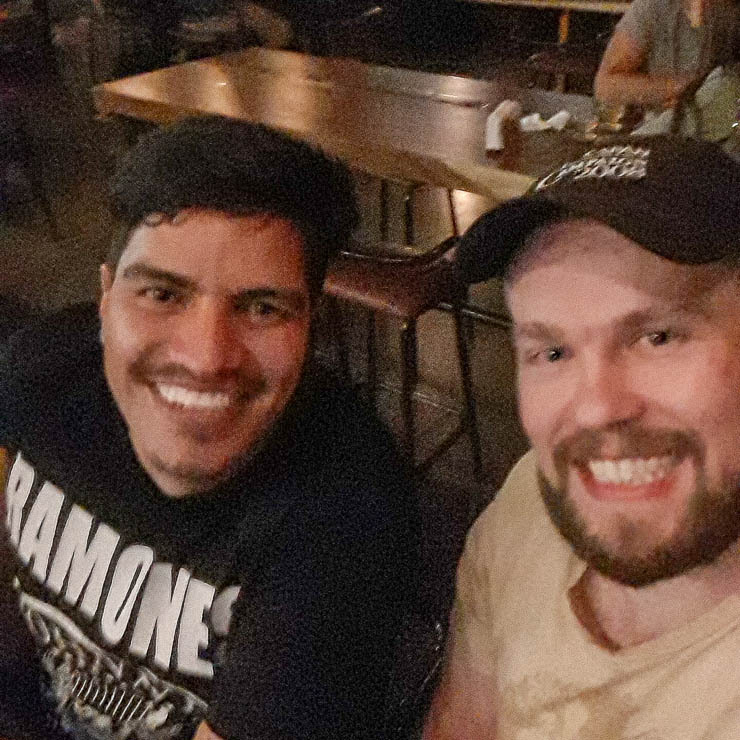 Pro Tip: the Wandering Paisa hostel nearby has some of the longest-running language exchange and dance nights in the city, it’s just about two blocks away, and those events are open to the public. Stay here, wander over there if you like. Bike rentals are also available and the friendly staff can also provide you with recommendations for where to go. Kick back and relax in the terrace or chill in a hammock. This hostel provides considerable kitchen amenities and plenty of space for you (not one kitchen, but two!) to cook your food. And you can keep your food because each guest has his or her own plastic box with a name on it. And a plus is the great kitchen is that they provide cooking essentials, herbs, and spices that all can use. 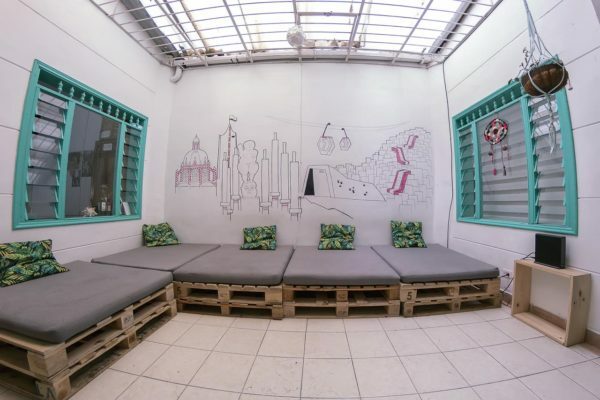 Is Hostal Cattleya Medellin the chill hostel for you? The best pizza in all of Medellin can be found at Piccolo Pizza nearby, get a half cabano and half pepperoni thin crust. It is exquisite. If you’re saying “what do you mean, pizza? I want some Colombian food!” Then head on down to Mondongo along 70 for some typical food. The famous mondongo soup is made out of tripe. Yum! They’ve also got other stuff though. There aren’t truly great coffee places in this neighborhood, but El Buho on 70 is just a few blocks away. Dance salsa until you drop at one of Medellin’s top three salsa bars: El Tibiri. 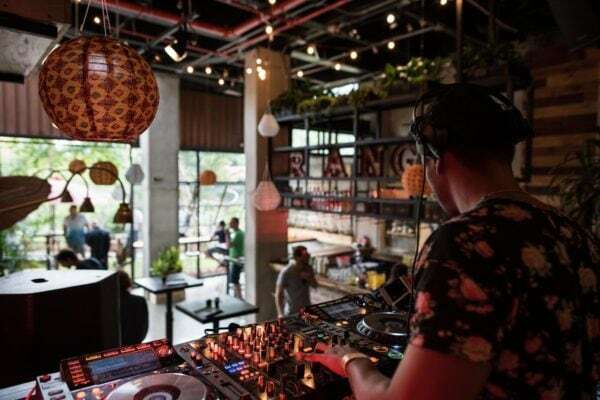 This sweaty little basement salsa hotspot is amazing and a must-do in Medellin. Go to a football game, duh! You’re within walking distance to the stadium, so make sure to attend a Nacional game. If there’s a superclasico against DIM, it’s a must do! Enjoy one of the city’s nightlife hotspots… Remember that whole chill thing? Well, 70 turns into one of the best nightlife areas on weekend nights, you can find most anything although it is primarily crossover music. Just walk up and down 70 to find something you like. Go for a bike ride, this part of the city, Laureles-Estadio, is the best area for biking… It’s flat, there are plenty of bike lanes, and it is the area best served by the Encicla bike share program. 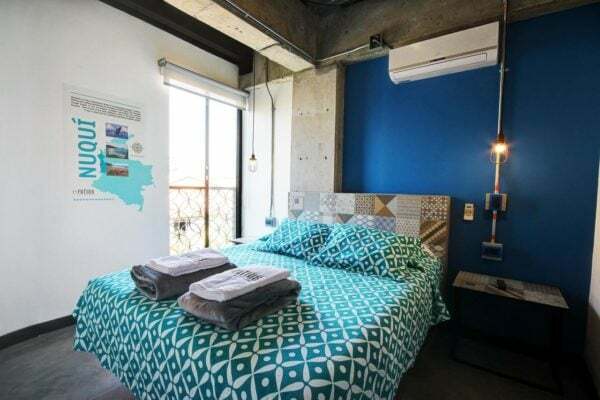 Rango Hostel Boutique is a trendy hostel along Calle 8 (two blocks from 10, the main drag) in Poblado and a few minutes away from Parque Poblado. 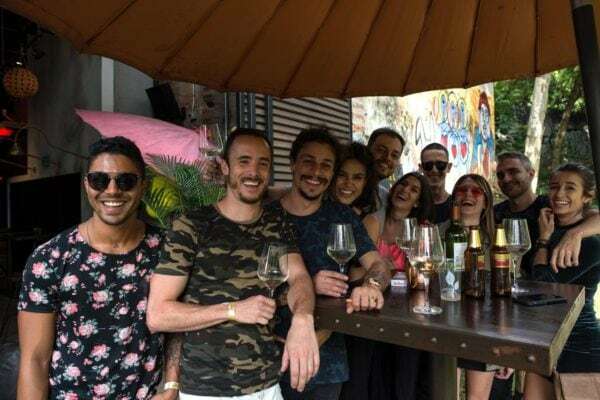 The hostel is also a minute walk from Parque Lleras where you can spend your nights partying away and also enjoy some of the city’s best cuisine from the many notable bars and restaurants. Stylish interior design was done using local materials to highlight the nature and design of Colombia. It also combined an industrial style to the interiors for a more modern look. 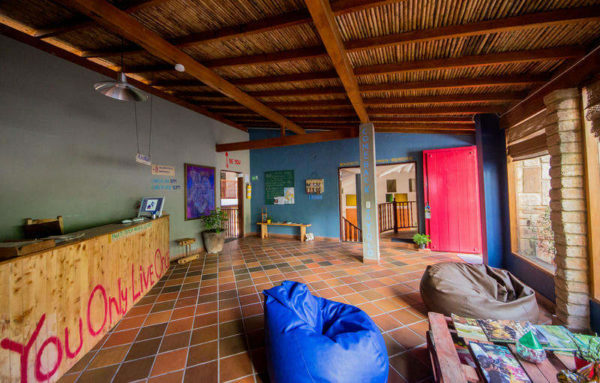 Rango Hostel also bridges the community to visitors by showcasing their art, locally made furniture, and service. You can enjoy working on your blog or updating your Instagram (Rango is perfect for the Gram!) in the terrace or at the garden. Take advantage of the reliable wifi that works in the shared lounge and everywhere in the hostel. They also have a restaurant where you can dine with friends or have some cocktails. Rango Hostel Boutique offers rooms starting at $19/night including breakfast (continental and buffet options) with beds in 4- or 6-mixed dorm rooms and private rooms. You might find it interesting that the bread is delivered every morning from a Swiss bakery in the area. Don’t worry there are also arepas, jams, and fruits for your daily breakfast. There are arranged activities for hostel guests like Taco ‘n Margarita Night, Ladies Night, and Salsa Night. You can book with the front desk for any of these activities or get some advice on what to do or where to go in Medellin (most of the time, locals give recommendations that aren’t even listed online). 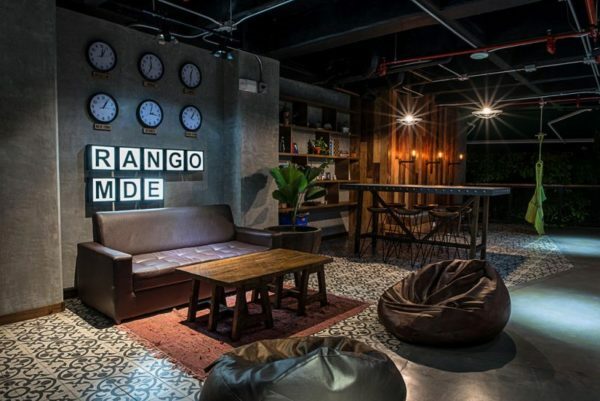 If you are a first time Medellin visitor, traveling alone or with friends, Rango Hostel Boutique is in a great location which is accessible to parks, tourist attractions, shopping, nightlife, and other places to explore. Medellin is famous for its many free outdoor gyms, so why not get in a workout at the nearby outdoor gym in La Presidenta park? You are literally next door to Cafe Zorba, one of the area’s most cherished restaurants. Go here for pizza, or coffee, or whatever really. It’s a must do! If you’re a digital nomad and want to get some work done in a more focused environment, check out the Global Express Business Center, one of the cheapest and best coworking spaces in the city. For a cup of truly great coffee, head up to El Pergamino near Parque Lleras and enjoy the hipster vibe that will make you feel like you’re in Portland or Brooklyn. For nightlife, I mean, you’re steps from Lleras the biggest concentration of bars and clubs in Medellin, but a couple picks that I personally like are Berlin Bar for a more laid back rock place and El Blue which is a club that has actually good music instead of just reggaeton, hah. This is totally random, but there’s also the world’s fanciest Tony Roma’s restaurant on top of the Dann Carlton hotel which features a 360-degree rotating floor, just like you’re dining at Seattle’s Space Needle or something! Prices are reasonable here, unlike the Space Needle. 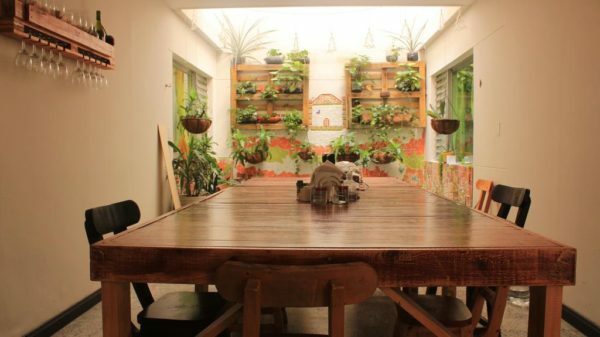 Medallo Social Hostal offers a cozy vibe in the middle of Medellin, El Centro. This place is a bit far from the typical touristy area, but it is in a charming barrio with tons of places for arts and culture and open spaces like parks and plazas. This is located in Boston, one of the most authentic neighborhoods in Medellin. Boston has a local market, football fields, and a free swimming pool. You can also discover libraries, museums, and theaters in the area. You are not also far from different stores, bars, and restaurants around the hostel. This hostel supports and helps the lives of disadvantaged children and women of poor villages in Medellin. They offer social activities and community projects that support the local community and one can inquire to join as volunteers. Room rates in Medallo Social Hostal start at $6/night with an option of adding $2 for breakfast (offers continental and American options). This hostel offers budget private rooms and beds in mixed dorm rooms. The property offers you the essential cooking ingredients in a well-equipped kitchen with a microwave. Free coffee is available the whole day and you can also enjoy it on the terrace. Some rooms even have their own kitchen and oven. If you like to support meaningful causes and staying in places that have a strong sense of social responsibility, then Medallo Social Hostal is the best hostel for you. 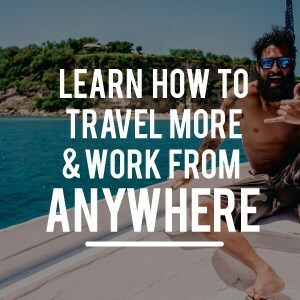 Not only that, but you’re definitely off the gringo trail here, so you’re likely to get a much more interesting, authentic, and memorable experience here. If you’re going to stay in El Centro, Boston is the best place to be, and Medallo Social Hostal is the best bet. Go hand out in Parque Boston for a better taste of local life — these areas are a hub of activity and always make for great people watching. Learn more about the sad history of violence and conflict at the Museo Casa de la Memoria. It’s free and it will give you a better appreciation for everything the locals have gone through. 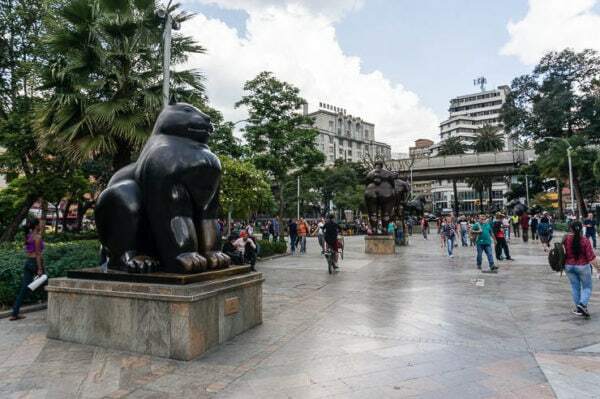 You’re a short walk from the downtown core with the Museo de Antioquia, Plaza Botero, and so much more. Read my guide to El Centro for way more details. Hit up the First Saturday open-air market in Parque Bolivar for an awesome time with all sorts of things for sale. Nightlife: You are a short distance from El Centro’s best nightlife near Parque del Periodista. Here you’ve got the #1 salsa bar at Eslabon Prendido, as well as interesting places like El Acontista jazz bar, Wall Street rock bar, or the awesome rooftop bar and restaurant at El Credenza on top of the Colombo Americano Building. 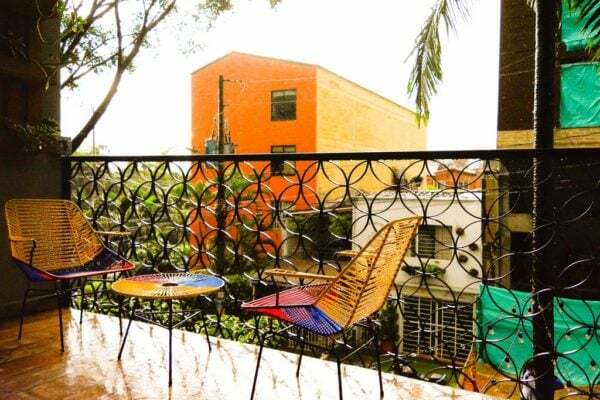 Backpackers Inn Medellin is located in Laureles, one of the coolest neighborhoods in Medellin. 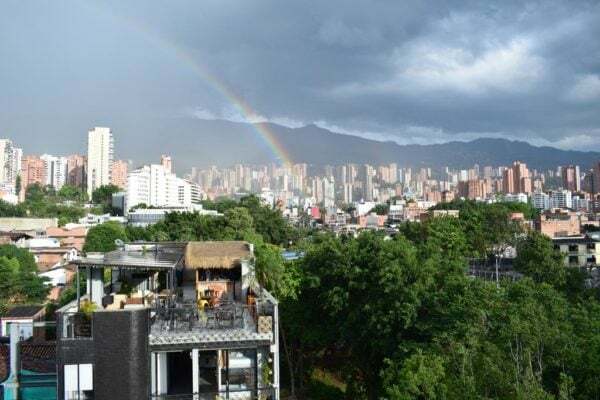 For me, Laureles is the best neighborhood in all of Medellin and is where I have spent most of my time living and exploring. 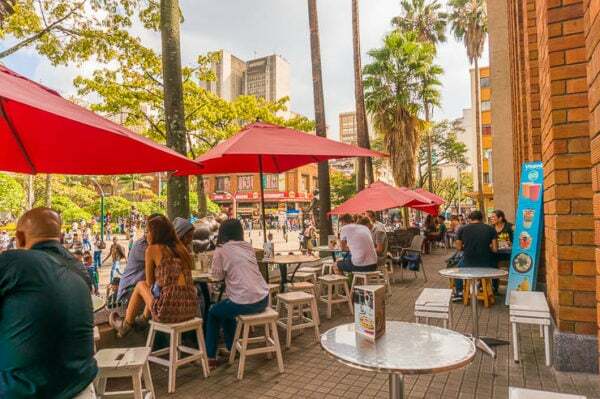 There is a good mix of reasonably priced restaurants to mid and upscale dining spots and it also the most bikable and walkable area in Medellin. It’s just a nice place to be, in my opinion. 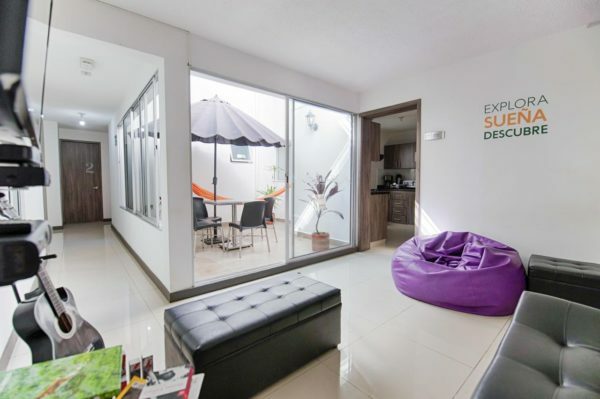 This hostel is also near public transportation (close to major bus lines on San Juan and a short walk to the Estadio metro station) giving you more mobility in your Medellin stay. The hostel is also near important shopping stores, universities like the Bolivarian Pontifical University, banks and open spaces such as the two Laureles Parks. Laureles offers a lot to discover if you prefer to be in a more quiet and secure neighborhood. I’ve written super extensively about Laureles, so just read my ultimate guide to Laureles for more details about why I love this area. Backpackers Inn‘s room rates start at $6/night and they offer bunks in mixed dorm rooms, beds in 4-bed mixed dorm rooms, mixed dorm rooms and twin rooms with bunk beds. There is a large kitchen to share to prepare your food. This property has a great patio for lounging around or meeting other travelers. You can enjoy playing darts or table tennis or stay in the entertainment area. There is also an outdoor common area where you can hang out and enjoy BBQ. A nice nap in a hammock is always a good idea during the midday heat. 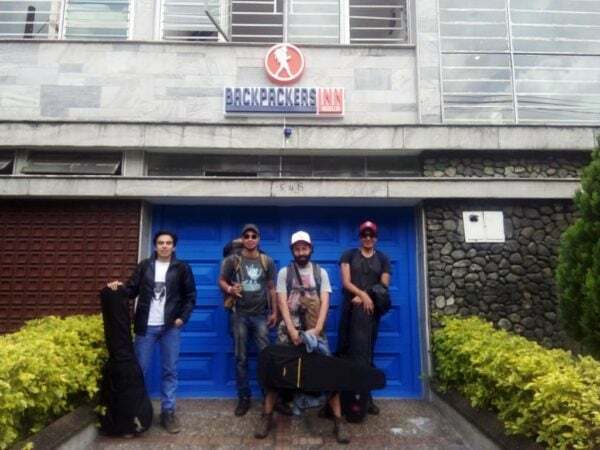 Backpackers Inn Medellin offers one of the cheapest room rates in Medellin but just as I said, just because it’s cheap doesn’t mean it’s offering less. 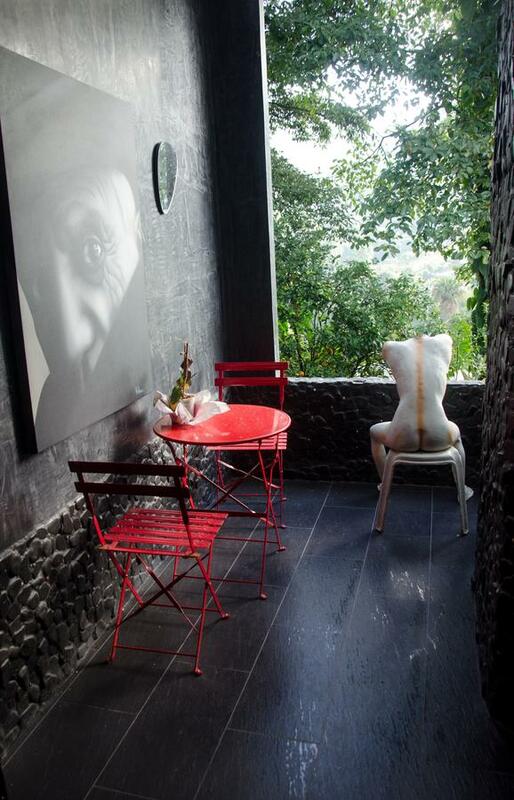 This one is definitely one of the best stays in Medellin and in one of the best areas, in my opinion. Visit the nearby Cafe Revolucion for one of the best coffee shops in the city. Looking for excellent vegetarian food? Then you’re in luck because what is probably Medellin’s best vegetarian restaurant, Salud Pan, is just a few blocks away! Their fixed menu lunches are amazing and a great value. Love this place! Naturalia is another amazing place nearby. Explore Nutibara: Nutibara is the main avenue of Laureles offering up the greatest mix of restaurants, shops, and places to explore. It’s the main part of Laureles and worth exploring. Enjoy La 70 (also mentioned above in the Estadio section) but a little further down, here you’ll find the great La Charcu bar with a huge selection of brews. Or check out Barrio Central for a different sort of place, one of the hippest bars in the area. Visit the city’s best bakery at La Migueria, located a few blocks south of the Second Park of Laureles. You’ll thank me later. 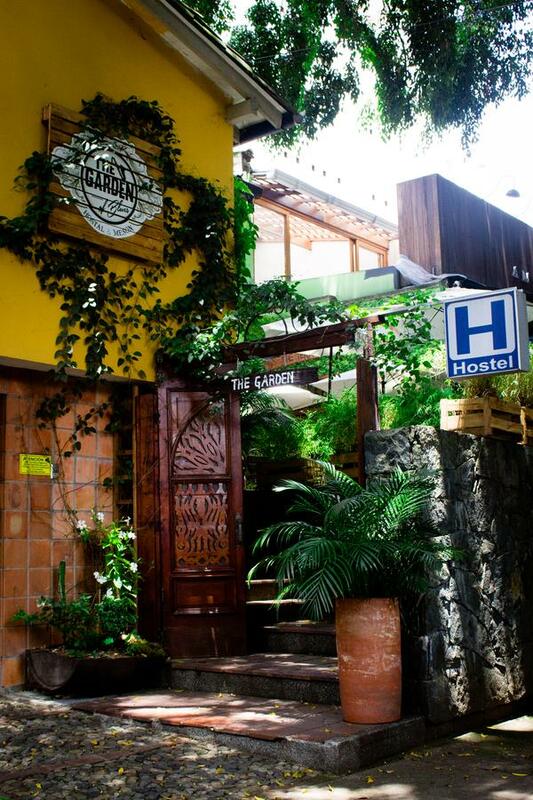 The Garden of Blues Hostel is the top reviewed hostel in Medellin in Booking.com with more than 1,160 opinions. The hostel is located in the Provenza sector of El Poblado, a little further uphill from the parks of Lleras and Parque Poblado. The neighborhood El Poblado where the hostel is located in the most popular neighborhood for expats and foreign travelers, as mentioned, but Provenza along with the previously mentioned Manila are my favorite parts of this large area. The walls are hand painted with different artworks mirroring the flora and fauna of Colombia. 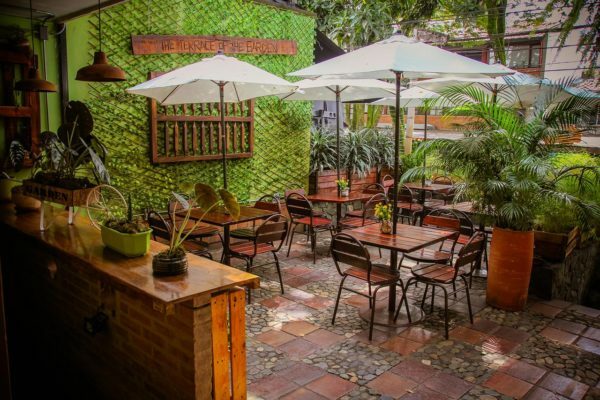 The gardens and the quaint patios with fountains complement the relaxed vibe of The Garden of Blues Hostel. They have comfortable couches around the patios where guests can hang out. It certainly looks cozy which matches the laid back vibe of Provenza vs the bustle of Lleras. The Garden of Blues Hostel’s room rates start at $10/night with breakfast (menu changes every day). 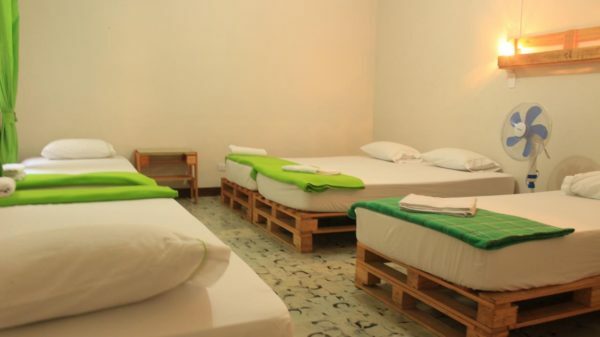 This hostel offers beds in 4-, 6- and 8-bed mixed dorm rooms, and private rooms. The property also has a business center, laundry services, currency exchange center, a shuttle service, and a shop. The atmosphere around the hostel is also relaxed. But it isn’t far from the buzzing nightlife of Parque Lleras and the sector of Provenza has many excellent restaurants and cafes. The Garden of Blues Hostel is in a great location for anyone traveling solo, as a couple, or as a group. My top pick for coffee in the area is the amazing Al Alma just about 2.5 blocks away. If you’re looking for a more complete breakfast, check out another branch of the previously mentioned Ganso & Castor French restaurant. If you’re looking for a great vegetarian restaurant, don’t miss out on Verdeo, which is about 6-7 blocks away. My top pick for some great beers is the nearby Bogota Beer Company (BBC) located right in Provenza. It’s on the list of the top beer in the city. If you’re looking to splurge on something fancy, the block above the hostel contains a number of gems like OCI.mde, La Chagra, and Tabun. Enjoy international cuisine like Naan Indian food (pretty good for Medellin) or at Bao Bei one of the best Asian fusion restaurants out there. If you’re a digital nomad looking to get some work done, check out the nearby Selina coworking space for an awesome place which also offers up lots of social events, business talks, and other networking events. Secret Buddha Gastro and Retreat was once a hostel with dormitory rooms. Now it is a breed between a hostel and a hotel. 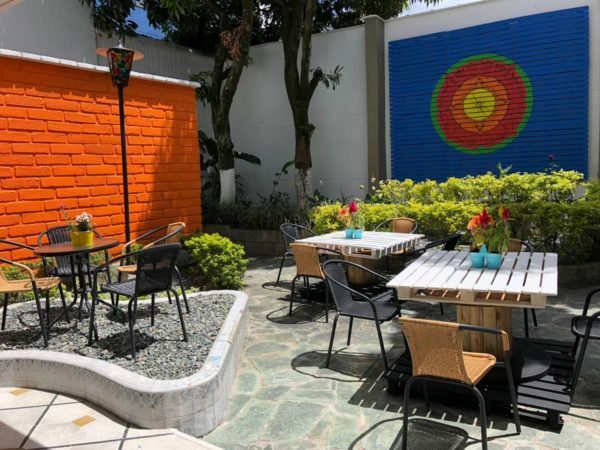 It is a bit high up in price for hostels but as you read on, you will understand why I can’t resist but to include it in this list of best stays in Medellin — well, I should say outside of Medellin since it is located a bit far south in La Estrella. This is the place you want to go if you’re looking to be outside of the big city but still within striking distance, or if you’re looking for a romantic getaway, perhaps. The design of the whole property is well thought out well with paintings, murals, sculpture, and art installation in all the right places. 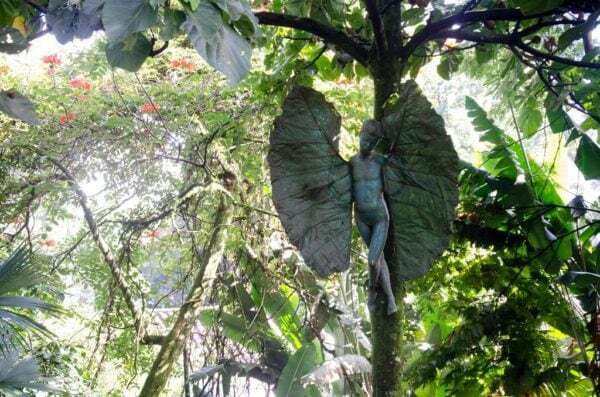 Some of the sculpture are incorporated in the plants such as hanging it up in the trees in the garden. The beddings are also extensions of the theme and the design of the room. 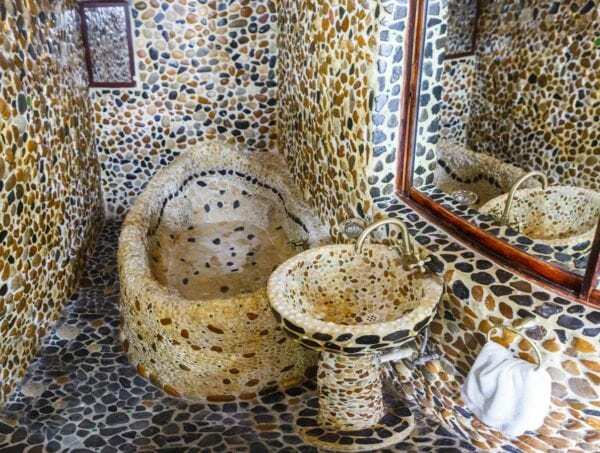 It is so artsy even the bathrooms are stylishly done with stones (plus the amazing rain shower!). 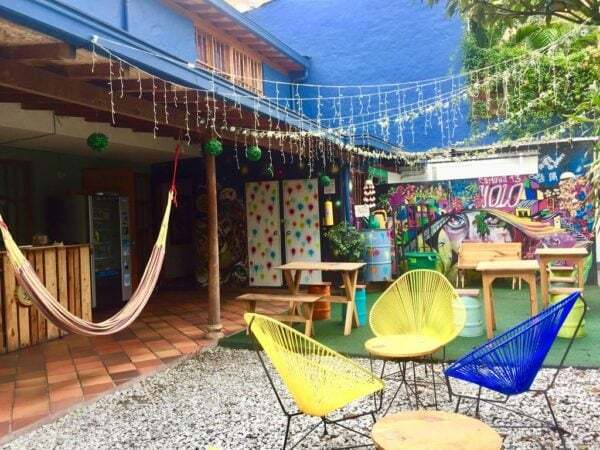 Sure, Secret Buddha is quite a ways out of Medellin, but a short cab ride from the La Estrella Metro Station (the last stop in the south) to this hostel will transport you to another world. They have private rooms, a king suite, and junior suite with balcony starting at $30/night with continental breakfast (continental, Asian, and vegetarian options). This property is surrounded by a herb garden and fruit orchards inhabited by natives species of birds and small animals. Secret Buddha offers activities like Yoga, meditation sessions, Reiki, gastro meals & tours, Mezcal tastings (the owner is a traveling chef and a Mezcal expert), paragliding, and horseback riding. The art in Secret Buddha is from all over the world and the owners of the property share it with travelers from all parts of the world. Experience this charming and funky place for yourself. Disconnect, relax, reconnect with nature and some peace and quiet… That’s the reason to be here. 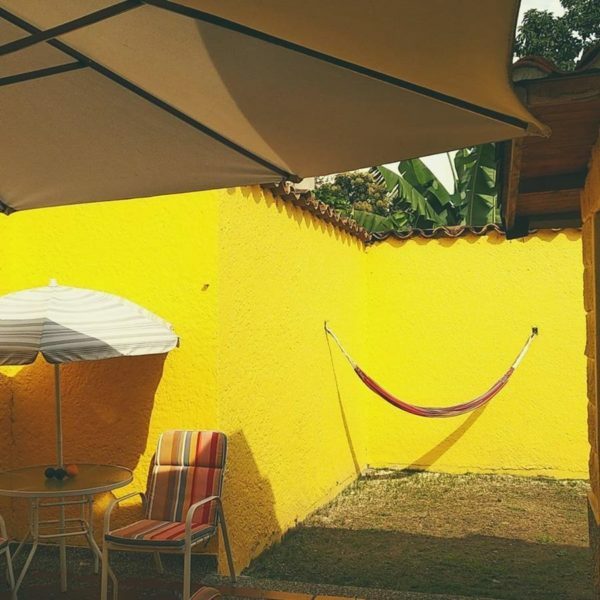 Yellow House Hostel is a few blocks away from La Floresta metro station (La Floresta is a sector of the larger Laureles-Estadio). This is located in a quiet residential area but still accessible to bars, restaurants, language schools, banks, and supermarkets. This neighborhood is cool, much more typical than certainly Poblado and even Laureles or Estadio. It’s still close to the action though, so maybe after a crazy night out, you might just need some OJ from the breakfast bar and a peaceful morning in this hostel. Yellow House Hostel offers room rates start at $6/night with breakfast. They have single beds and bunks in mixed dorm rooms and private rooms with private bathrooms. There is a nice back patio in the property with gazebos and a hammock offering a calm atmosphere whether in your sleeping space or the communal spaces. You can also enjoy the BBQ place if you’d like. If you want to do some work while on vacation, you can take advantage of the Wifi terrace or indoors. A safe and quiet place to rest is what you can find here. The hostel also offers several tours around Medellin like paragliding trips and rafting if you want to are quite the adventurer. 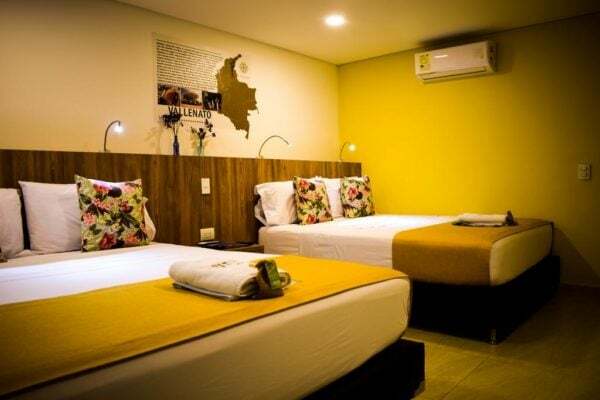 This is probably the smallest hostel in town but Yellow House Hostel can be your home when you stay in Medellin. 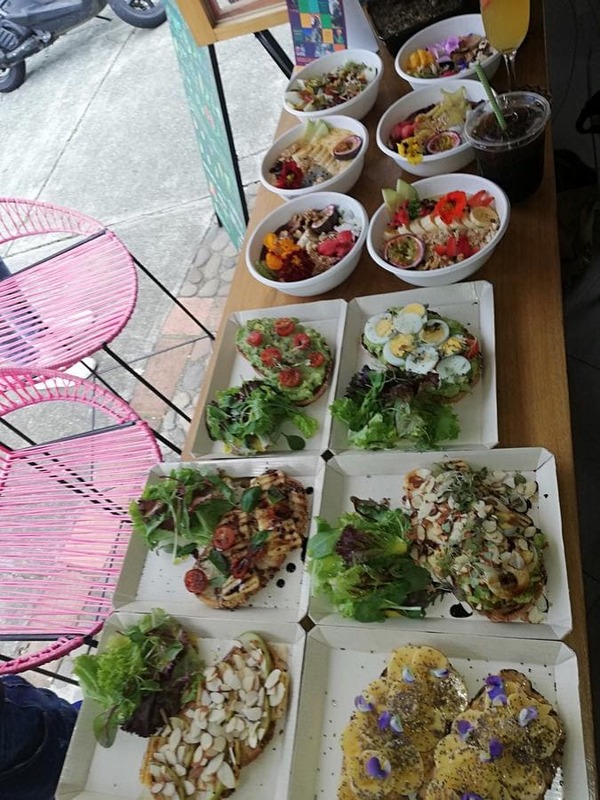 Grab coffee or a bite to eat at the amazing Cafe Ondas just a few blocks away from you. 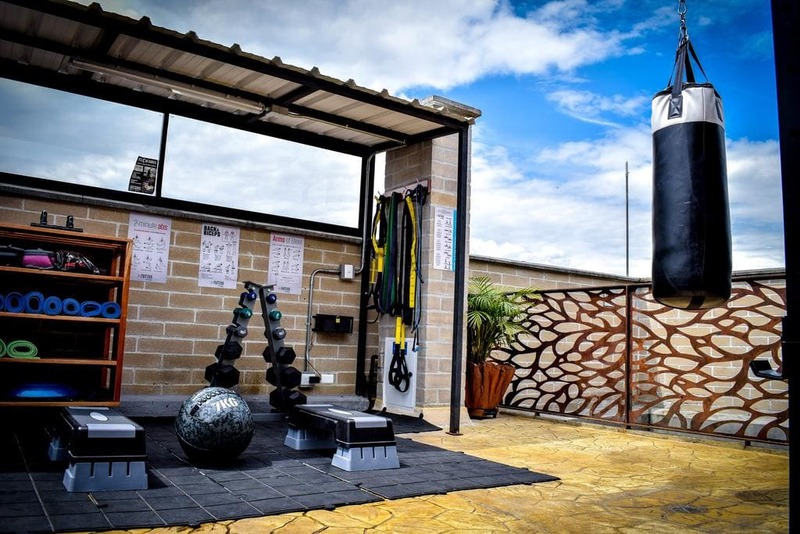 Get in a workout with the locals over at the Unidad Deportiva La Floresta: you’ll find a free outdoor gym, soccer fields, and so forth. You can also go for a run nearby: follow underneath the metro track and do loops around Estadio, that’s a favorite route of mine. Speaking of Estadio, likewise be sure to go to a game at the stadium, it’s a short walk from here, or just a single metro stop if it’s after dark (always a good idea, after dark). The whole of La 70 is where you’ll find the massive nightlife. Hang out in La Floresta Park, this park isn’t quite such a huge center of activity like in Belen, Boston, or Envigado, but it’s a cool space nonetheless. Enjoy a typical menu of the day (you won’t find much in the way of upscale restaurants here, which is all the better, in my opinion!) where you can get a big meal for about $3 including soup, a main plate with your choice of meat, and a fresh fruit juice. You can eat better and way cheaper here than in Poblado, that’s for sure. Go on the Comuna 13 tour — while you don’t have to go on a tour, most choose to do so — this is where you can see the urban transformation taking place and some of the most incredible street art. The start of the tour is just two metro stops from La Floresta. 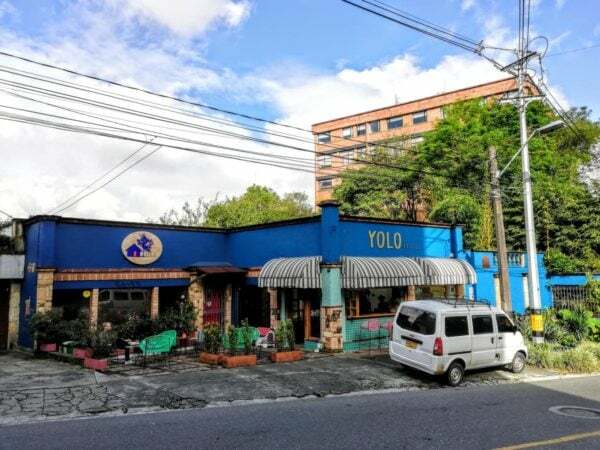 Yolo Hostel Medellin is situated in the upper side of the Provenza sector of the El Poblado neighborhood and it is about 10 minutes walk away from Lleras Park up a somewhat steep hill. The neighborhood is best for travelers interested in nightlife, restaurants and other tourist spots of Medellin. 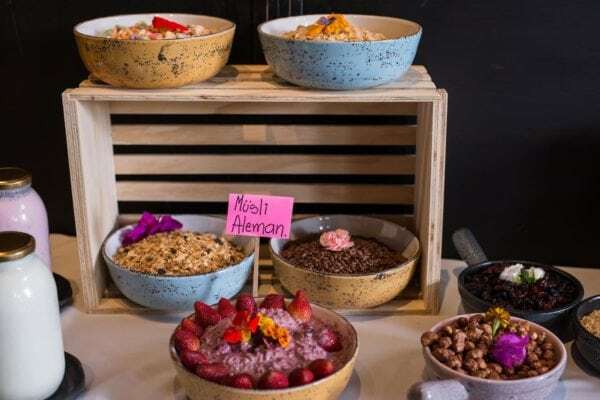 Room rates in Yolo Hostel start at $12/night but you can add $3 for a super breakfast (fruits, salads, granola and that yummy coffee from their own coffee farm). 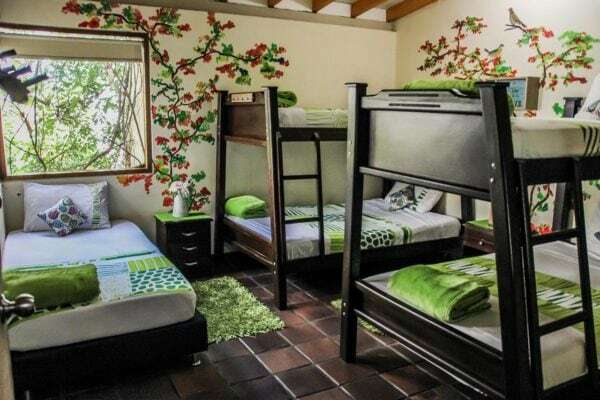 Yolo Hostel Medellin offers beds in mixed dorm rooms and private rooms with shared or private bathrooms. Some rooms come with a patio. The dorm rooms are spacious and you can choose from several common areas. This property has a garden, shared lounge, and hammocks area. Some more freebies from this hostel that you can enjoy are free walking tours and free use of bikes. But you can also try the transformation tour where you can enjoy a day with local kids and get to more about Colombian life. YOLO. 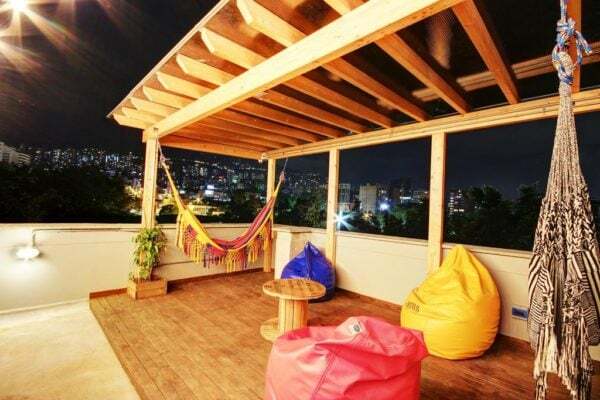 Indeed, you only live once and Yolo Hostel Medellin can help you enjoy life in Medellin. Book a night or maybe a few weeks with them now. See the other section on Provenza above, this hostel is located a few more blocks uphill (aka further from the metro station) so it is basically the same tips, but this one is situated right next to the Selina Coworking space which is pretty sweet. Hostal Rich is located in the neighborhood of Estadio which is close to many restaurants, stores, and metro station. A few minutes from the hostel is Plaza de Toros La Macarena, Laureles Park and Estadio Atanasio Girardot. Hostal Rich offers double rooms with shared or private bathrooms and family rooms with private bathrooms with room rates starting at $13/night. 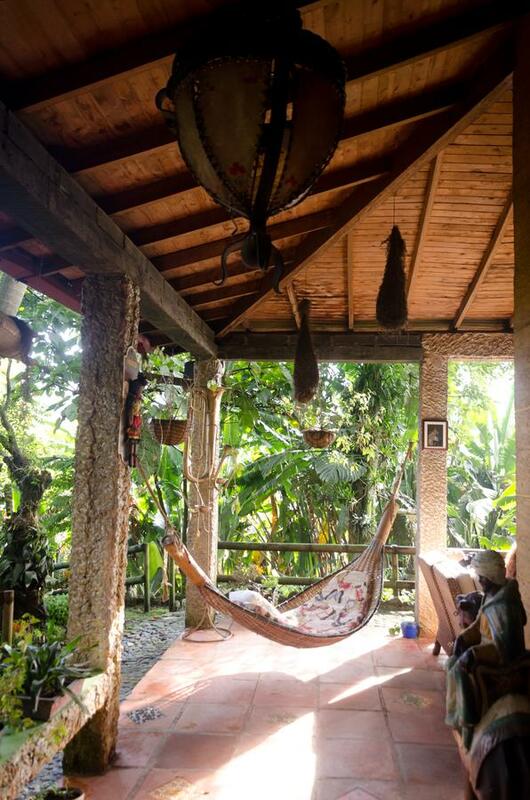 The property has a garden and a terrace where you can enjoy your book and a cup of Colombian coffee. The hostel provides you with a well-stocked and well-equipped kitchen where you can prepare your food (you can ask staff to help and they might even teach you a Colombian dish). Hostal Rich is one of the top hostels in Estadio neighborhood. Stay here and experience Medellin. 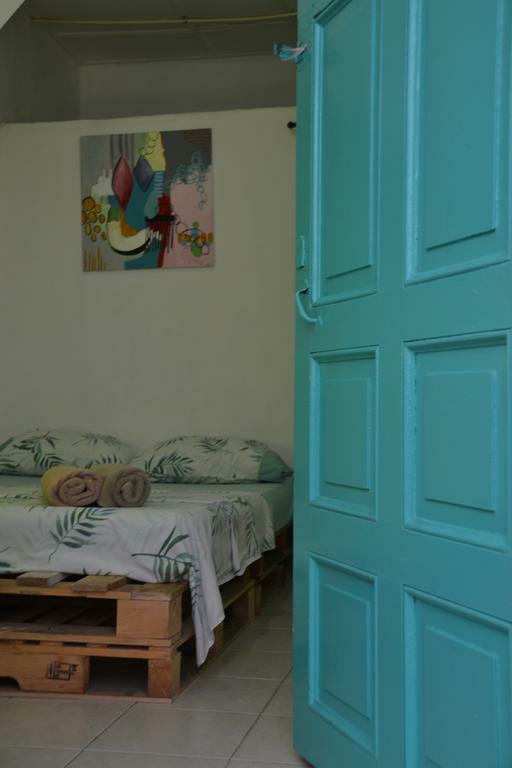 This hostel is located right near our other pick in Estadio, Hostal Cattleya, so all the same recommendations and tips apply here. Check the best rates of Hostal Rich on Booking.com now. 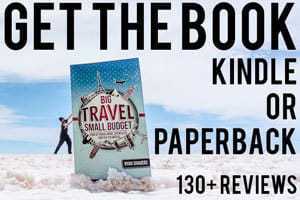 One of the biggest expenses in traveling is accommodations and no one wants to blow their budget on just lodging (so be sure to check out my article on finding cheap accommodation). While traveling in South America, you will find many hostels and cheap hotels, along with some pretty affordable places on Airbnb (my recommendation for longer stays). 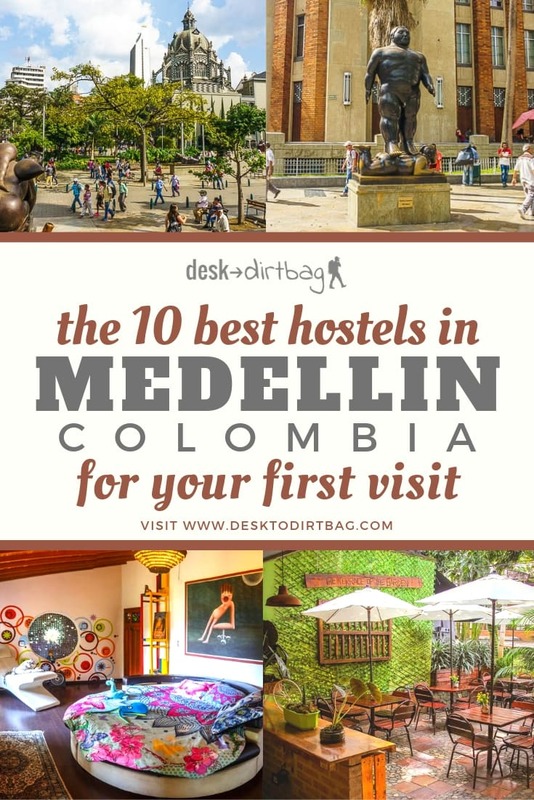 But for shorter stays in Medellin, your best bet is one of these hostels. Got any more suggestions for other hostels? Leave a comment or send us a message so we can include it here. Medellin for the past 20 years has truly defied the odds and surpassed everyone’s expectations by moving beyond its previous dark reputation. This is the city in South America that I have most extensively written about, not only because it is where I am based but, because I want to help the world discover how incredible this place is with its warm people, forward-looking perspective, and an almost endless amount of things to do and places to discover. 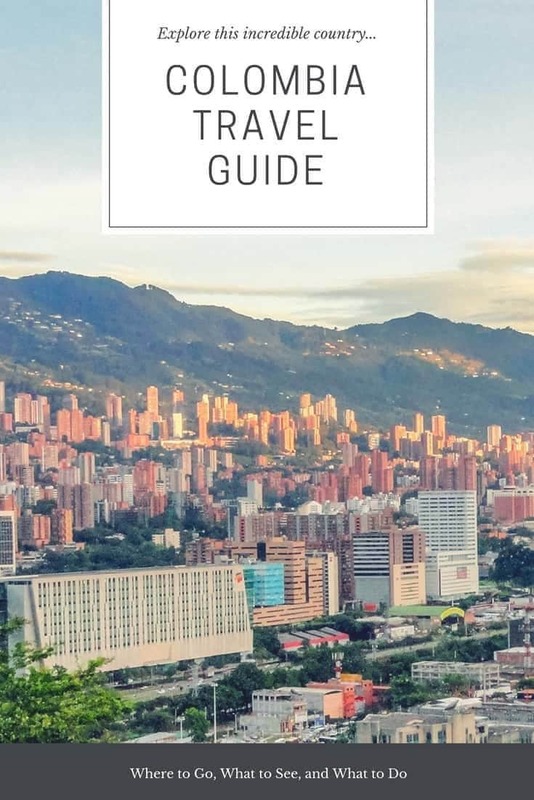 You can also check out my comprehensive guide of things to do in Medellin so you will know a little more about the coolest places to explore during your stay in this wonderful city (my favorite in Colombia and my home for the past few years). Don’t forget to think about your safety and security. 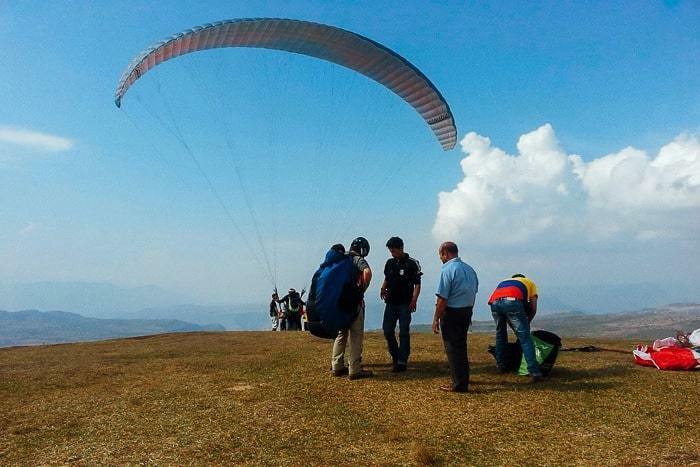 Travel insurance is like a parachute you can pull when you need it. Before coming to Colombia, be sure to get your travel insurance, just like I did, with World Nomads. 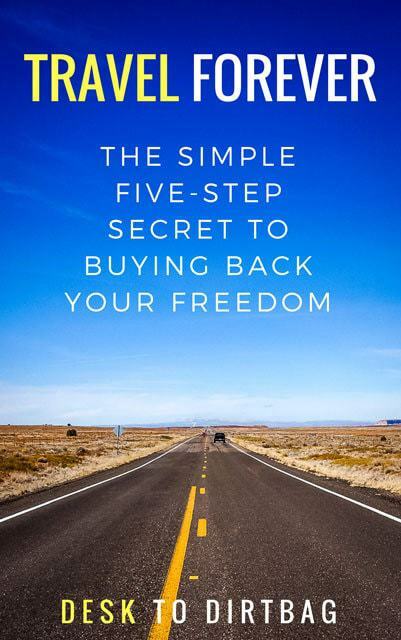 It will give you a backup plan in case things turn the exact opposite of what you originally planned. 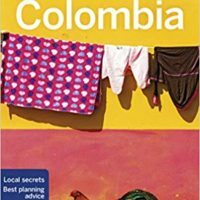 Traveling to other parts of Colombia? Don’t miss my comprehensive guide for traveling to Colombia with all the information you need to plan a better trip. Did you enjoy this post about the best Medellin hostels? Take a moment to share it on Pinterest, Facebook, or Twitter. Thanks.